Markets rally for 5th day. The growth momentum is continued for the fifth straight session on Tuesday amid firm global cues, value buying and fear of rate hike by US Fed is doubtful on sluggish US job data. Mumbai: The growth momentum is continued for the fifth straight session on Tuesday amid firm global cues, value buying and fear of rate hike by US Fed is doubtful on sluggish US job data. 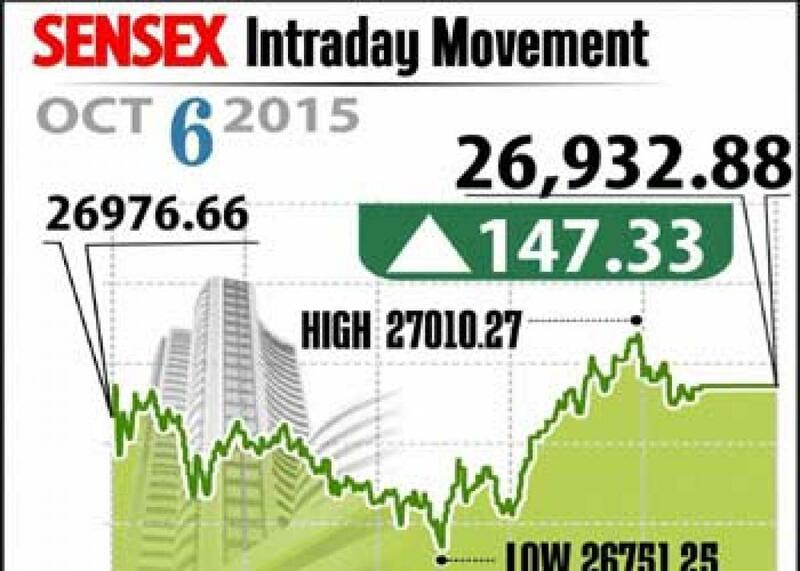 Sensex up by 147 points to close at 26,933 and Nifty zoomed 34 points to close at 8,153. The broader markets trend is following index stocks with Midcap and Smallcap indices up 0.3 per cent and 0.7 per cent. Expert expect the rally would continue through the week as September quarter earnings to start releasing from Monday. They predict Nifty to touch 8,350-level in the short-term. On the sectoral front, about 7 sectors closed in green out of 12 sectors, with consumer durables gained over 4 per cent. While FMCG stock ITC up by 4 per cent as the company plans to enter into the dairy segment with its new product Aashirvaad ghee starting from Diwali. PSU mining major Coal India raised 4 per cent with the Credit Suisse upgraded its ranking to 'outperform'. On the other hand, banking stocks closed in red since most of the traders decided to book profits as the shares have increased sharply in the last few sessions. HDFC Bank and Axis Bank fell by 1 per cent. The gainers: Tata Motors, up 5.81 per cent at Rs 333.50; ITC, up 4.21 per cent at Rs 342.90; Coal India, up 4.02 per cent at Rs 342.75; Cipla, up 3.36 per cent at Rs 663.55; and Gail, up 3.17 per cent at Rs 307.95. The losers: BHEL down 2.82 per cent at Rs 198.05, Infosys, down 2.17 per cent at Rs 1,154.85, Maruti Suzuki, down 1.32 per cent at Rs 4,357.30, NTPC, down 1.30 per cent at Rs 125.75 and Axis Bank, down 1.05 per cent at Rs 506.65.